I love anything chocolate mint and fruity! 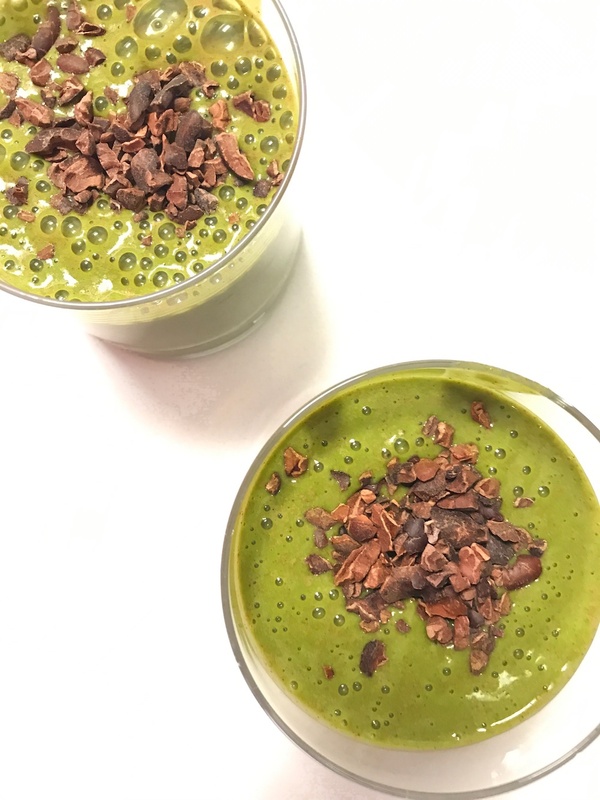 This tasty smoothie is loaded with potent antioxidants found in the cacao nibs, heart-healthy electrolyte potassium from the banana, bone-healthy calcium from the almond milk (but only if it’s calcium-fortified) and contains digestive properties from the mint leaves. Altogether this smoothie tastes like a healthy mint chip milkshake, so it makes for a nice mid-afternoon snack or as a part of any meal. Cacao nibs have quickly become a top favorite of mine and can be found in a lot of my recipes! So, why am I so crazy about them? In short, they’re tiny nutrient powerhouses that add a nice and crunchy texture and are loaded with antioxidants. Fresh mint also used in this smoothie can help to tame and upset stomach, and can also be added to hot water to make an all-natural mint tea. If you can’t find mint leaves, try adding 1-2 drops of peppermint oil to the smoothie for added mint flavor. To mix this smoothie up you can substitute banana for peaches or mango and you can also swap out almond milk for other, and creamier non-dairy milks to thicken the consistency of the smoothie. 1 scoop plant based protein- like this Garden of Life protein we love to use. 1. Wash leafy greens and prepare the rest of the ingredients. 2. Add all ingredients to your blender and blend on high for 45 – 60 seconds. Want more smoothie recipes? Click here!